Happy April 1st, everyone!! Today is the first day of my first attempt at the A to Z Challenge! Throughout the month of April I will be blogging every day, except Sundays, for a total of 26 days. The topic of each blog post will correspond to the subsequent letter of the alphabet. And today we will kick things off with the letter A! 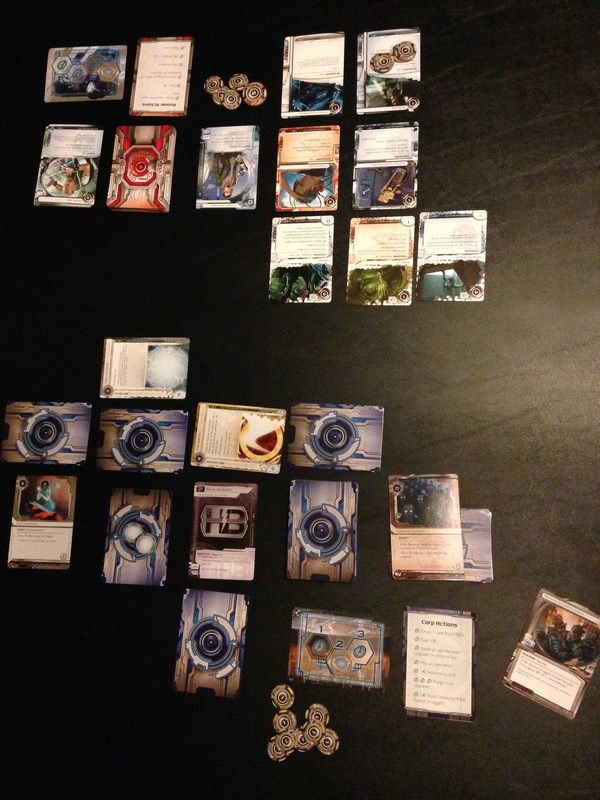 A is for Android: Netrunner… I love tabletop games. If you asked me to pick my favorite game, I would be at a loss. There are so many great games out there now. My list of favorites is always changing. It depends on whom I’m playing with, if I get burned out over playing a game too much, or if a new game replaces an older one by scratching the same itch. But Android: Netrunner is one of those games that continues to stay in my top ten month after month. Android: Netrunner, often shortened to A:NR or simply Netrunner, is a card game designed by Richard Garfield — a man best known for creating another popular card game, Magic: The Gathering. Like Magic, the first iteration of Netrunner was a CCG, or “collectible card game.” The current version, published by Fantasy Flight Games, is an LCG, or “living card game.” The difference is that CCGs come in randomized booster packs, while LCGs come with a set group of cards in each expansion. One of the reasons why Android: Netrunner is so fascinating to me is that it is an asymmetric game. That is, the mechanics of gameplay are different between the two players. You see, Netrunner takes place in a cyberpunk setting. One player will play as the big, bad Corporation; the other will play as a hacker, or as they are called in-game, a Runner. 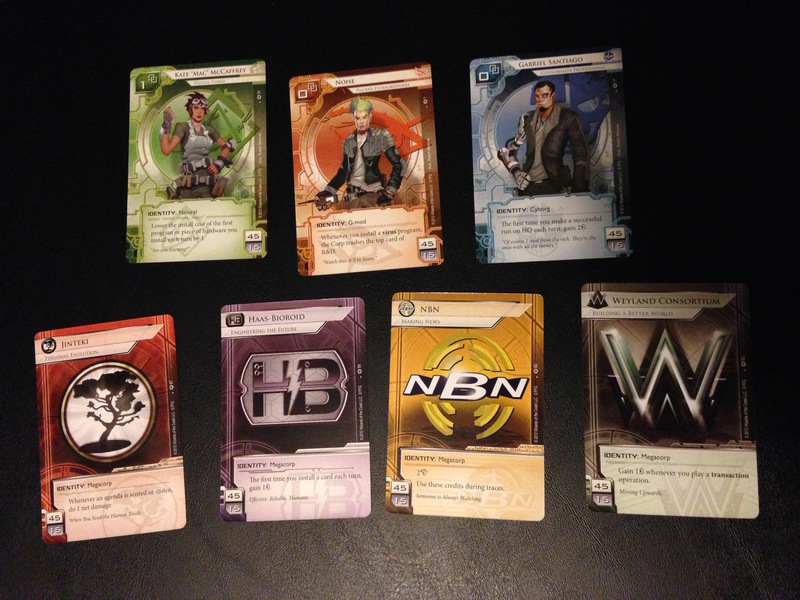 The core set of Android: Netrunner comes with three different Runner decks and four Corporation decks. This offers so much replay value, as well as the opportunity to personalize the game to your own play style. Runner factions: Shaper (Kate “Mac” McCaffrey), Anarch (Noise), Criminal (Gabriel Santiago). Corporations: Jinteki, Haas-Bioroid, NBN, Weyland Consortium. As the Corporation, the player’s goal is to advance their greedy schemes by scoring agenda points. The Runner, however, is seeking to steal these points, thereby preventing the Corporation from furthering their shady dealings. The first player to seven points wins. In essence, Netrunner is like a shell game. The Corporation player lays her cards face down in positions known as “servers,” and can advance them using tokens. These servers are protected by special cards known as ICE (Intrusion Countermeasures Electronics). The Runner must then use his cards (which include special programs, hardware, and resources) to break through the defensive layers of ICE and get to the agenda card before the Corporation has time to advance it. This is what a Netrunner game in progress looks like. The Corporation (Haas-Bioroid) is below; the Runner (Gabriel Santiago, Criminal faction) is on top. Thanks for stopping by my place! I’m not into games, but this one does sound intriguing! This is a great game! I’ve only had the chance to play once before, but I’m always looking for good two-player games that my husband and I can play together. I need to get my own copy! Enjoy the rest of A-Z! The only Living Card Game I’ve tried to play was the Game of Thrones one from Fantasy Flight, which looked complicated, and then it was an LCG… never ended up playing. However, Netrunner sounds more fun – and I really like the description of the starter box. That seems more friendly for someone looking to get started and buy just one thing! I may have to see if my local game store has it! There wasn’t really any customizing in the AGoT starter, as the multiple decks were for the different families. And it seemed better with more players. I like the 2-player potential with Netrunner, hard to find good 2-player games!